View of the pot showing the molded spout. Another view showing the printed handle. A large pearlware punch pot printed in a smoky brown with the Boy on a Ram pattern and painted in warm colors underglaze with brown enamel banding around the collar and the rim of the lid. 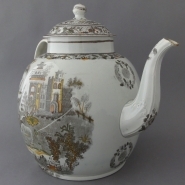 The pot has an acanthus leaf and rib molded spout. A floral and leaf design was used for the border and lid. 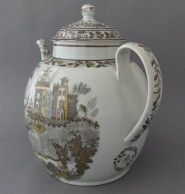 The pot is attributed to the Swinton Pottery, Greens Bingley period. For a matching example refer to Griffin, John D. The Yorkshire Potteries, page 95, plate 126.